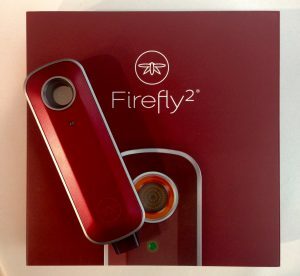 One of our newest portable vaporizers is the ever so wonderful Firefly 2! This model is much smaller and lighter than the first generation Firefly and also has a free app for you to personalize your vaporizer. Once the app is downloaded, there are options to change the temperature and to adjust the touch sensors to fit any personal preference. The Firefly 2, unlike the first generation, has the ability to do both concentrates and dry material. The unit comes with three concentrate pads that are to be inserted into the heating chamber. Once one is in the chamber, just add a small sized chunk of concentrate on to the concentrate pad and change the vaporizers temperature setting to “concentrate” in the app for the best vapor production. When using the vaporizer for dry material, simply fill the heating chamber, touch both sensors, and watch the chamber heat up to 400 degrees in 10 seconds or less. The Firefly 2 still has the same convectional heating mechanism as the first generation Firefly to give you the quickest vape possible. The Firefly 2 also comes with an extra battery to ensure that you will be able to use your unit all day. Each full battery charge will give you 40-80 draws depending on use. This new vape also has a removable mouthpiece with a filter to prevent any material from coming out of the unit itself. If the mouthpiece seems clogged, simply remove it to clean it and pop it back on. We absolutely love this vaporizer. Not only is the functionality super simple, but it is one of the easiest to clean as well. Simply remove the lid and wipe down the vaporizer with the alcohol wipes provided. However, Firefly’s website recommends not to pour rubbing alcohol on the vaporizer itself because this will damage the unit. There is also no need to clean the concentrate pads. To read more and check out their YouTube video please visit Firefly’s website!